Keith Gehle performed amazingly for our wedding ceremony and reception! In preparing for our wedding, he made many great suggestions for music selections! On our wedding day, he was very professional, dressed well, and arrived early. His performance received many compliments! Everyone asked about him and stated how well he played even in the cold weather! I couldn't have asked for a better guitarist! I definitely would recommend Keith to any bride looking for classical and instrumental music! Please call or email today for your custom quote or to request your FREE music portfolio and wedding favorites mp3. 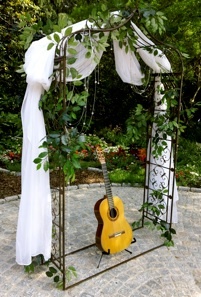 You and your guests are certain to enjoy the beautiful music by Atlanta’s most experienced ceremony guitarist. We are so happy that you could be a part of our special day! Our family is still talking about how beautiful the music was you played! We're looking forward to seeing you play in the future. You were wonderful at Katie's wedding! Everything sounded beautiful and the couple was so happy with your work. Thank you for always being such a joy to work with - you are the utmost in professionalism and talent! I look forward to working with you in the future and will certainly continue to refer to you! Daniel and I cannot thank you enough for all you did to make our wedding ceremony so special! Your music was absolutely exquisite, and we received many compliments. You were wonderful to work with, and we fell very blessed that you were part of our special day. I will be happy to serve as a reference, so please let me know if there is a place where I can leave feedback. Thank you again for the beautiful music! Everyone loved you! Thank you SO much for your beautiful music provided for our special day! It was flawless & everything I imagined it would be. We will be recommending you to all of our friends! Thank you so much for making our wedding ceremony so special. We have had so many compliments on the music! You were so enjoyable to work with and we will highly recommend you. Thank you for sharing such beautiful music. ✦ 30 minutes of captivating music prior to the hour of the wedding as family and guests arrive. ✦ Processionals, musical interlude (if necessary), recessional and post recessional. ✦ Pre-wedding in person consultation with the bride and groom (or parents) for music selection and ceremony coordination. Planning session by phone consultation available as well. ✦ All sound equipment necessary for the event. ✦ FREE use of a quality, wireless lapel microphone for your wedding officiant. Many area DJ’s and venues charge hundreds of dollars for the use of this piece of equipment but for Keith’s clients it’s part of the service.